Navy yellow, polycotton lightweight (245gm or 7 oz) overalls, with double bands of reflective tape. 2 breast zip pockets, side access slots at waist level; elasticated waist band with an action back - to allow ease of movement. This is a practical yard boilersuit: navy in the areas that are likely to get dirty, with hi vis yellow on the upper limbs to improve your visibility. It has double bands of 2" (50mm) silver reflective tape - again for your safety and visibility. Tripled stitched throughout for maximum quality. 65% polyester to 35% cotton, allowing safe washing up to 60 degrees. This is a lightweight coverall - so it can be worn comfortably over undergarments or trousers. So light, you will barely notice the extra layer. 89821-121-530 Made by Wenaas of Norway - the coverall specialists. Red & yellow 300gm medium weight polycotton coverall. Concealed front zipper with press studs. Two chest pockets, two cross pockets, two back pockets and one tool pocket. (Non FR). This is a great looking two tone boilersuit. The polyester content extends the life and wear of the boilersuit; it minimises shrinkage from washing & drying; it ensures that the colours stay bright. The cotton ensures that this feels soft against your skin. Fristads Kansas Bib & Brace 1001 TH with Adjustable elasticated braces and Bib pocket with flap and button. 2 side pockets and Leg pocket with flap and Velcro fastening, phone pocket with flap and Velcro fastening. Back pockets and Folding rule pocket with pen pocket, and button and loop for sheath knife. Waist opening with buttons and Knee pockets with opening for height-adjustable knee pads. Approved according to EN ISO 20471 class 2, "OEKO-TEC" certified. Leasing Laundry-tested according to ISO 15787. It includes knee pad pockets, rule pocket, back pocket, chest pockets and concealed side access pockets for easy and convenient storage. It is triple stitched on the seams to ensure that it is long lasting and features radio loops. Made from Modaflame, 60% Modacrylic, 39% Cotton and 1% Carbon Fibre. 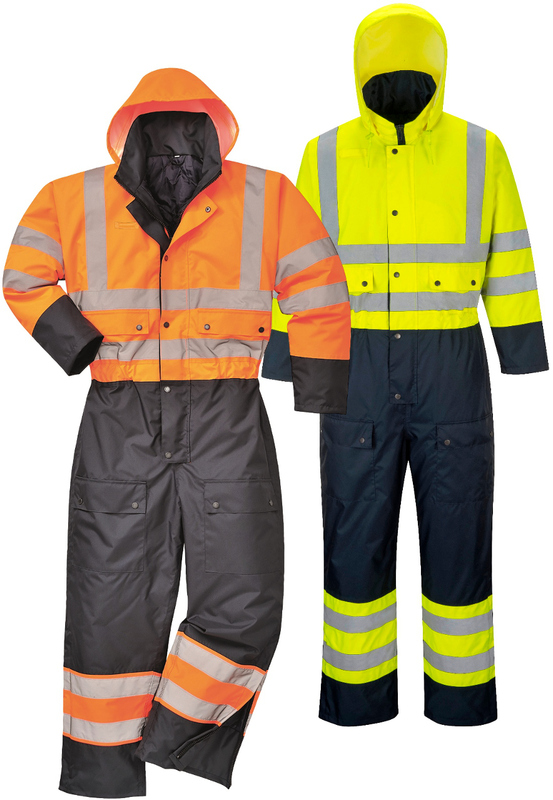 This popular coverall offers excellent levels of protection against flame exposure. High visibility thanks to FR reflective tapes placed on shoulders, sleeves and legs. Its functionality includes multiple pockets and knee pads pockets. Made entirely of Bizweld 330g/m flame retardant fabric. Portwest BIZ5 FR Hi Vis Knee Pads Pockets Coverall conforms to: EN ISO 11612 A1+A2, B1, C1, E1, F1. EN ISO 11611 Class 1, A1+A2. (welding std) standards. It provides the wearer with added visibility in poor lighting conditions. It is waterproof, breathable and tear resistant making it suitable for a wide range of working environments. It also has a concealed hood and adjustable hem and cuffs. This coverall conforms to EN471 CLASS 3:2 and EN343 CLASS 3:2 safety standards. Made using Sealtex Ultra, 100% Polyester. The Portwest coverall is perfect for multiple work environments and conditions. It is flame resistant making it ideal for wear near heat or flames. The high visibility reflective tape on the body and legs provide added visibility in poor lighting areas. It includes knee pad pockets, a rule pocket, side pockets, adjustable cuffs, radio loops and a concealed front stud fastening. This product conforms to EN ISO 11612 A1+A2, B1, C1, E3 & F1. Made using Bizweld, 100% Cotton. Successfully combining comfort and protection suited specifically for offshore workers. The Wenaas Offshore Daletec 350a Coverall is made from a mix of cotton and antistatic fibres, meeting EN ISO 11612 standards for protection against heat and flames. Reflective tape on the shoulders and around the arms and legs is designed to improve visual presence in the workplace. 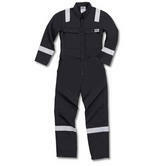 This FR coverall is packed with features, with a number of pockets throughout for storage of personal effects. 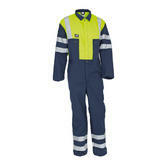 Wenaas 80920-15511 Daletec Offshore Coverall conforms to: EN 1149-5, EN 61482-1-2 cl. 1 safety standards. 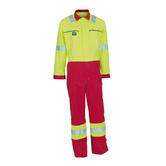 This new Hi-Vis coverall guarantees maximum comfort, safety and durability. The modern contrast high visibility colouring combined with clever features such as a concealed mobile phone pocket or the radio loop and knitted cuffs. All these features make this coverall an ideal workwear solution for a range of professionals. Complies to 20471 class 2 safety standards. Fully breathable to ensure comfort for the wearer. It has high visibility due to the reflective tape on the legs, chest, arms and shoulders which ensure the wearer remains visible even in poor lighting conditions. It is fully lined for added warmth. It includes zipped ankles, ribbed cuffs, a radio loop and multiple pockets for store belongings safely. 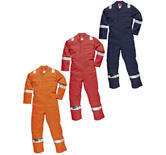 This coverall conforms to EN471 CLASS 3:2, EN343 CLASS 3:1 and EN342 CLASS 3 safety standards. Coveralls are quilt lined / winter lined for extra warmth. With 100gsm of Fire retardant internal padding insulation ie inside the 260gm Nomex outer material. The most comfortable flame retardant coveralls you will probably ever wear! These Nomex Comfort 3A's are well insulated, have multiple pockets. Made by NERO with Sofileta and from 93% Nomex, 5% Kevlar and 2% P140 Antistatic fibre. This Coverall is very lightweight - making it easy to wear around all day. Manufactured with 80% Polyester & 20% Cotton. Full configuration of reflective tape, providing hi visibility. Secure and comfortable fit with an elasticated waist. Front zip fastening system, easy to use. This overall is GO/RT compliant. 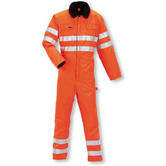 Arvello PCRTBS Polycotton Hi Vis Orange Coverall conforms to EN471 Class 3 standard. These coveralls come with numerous features that make these coveralls an important piece of any workman’s protective clothing wardrobe. They are made with Bearnylon which is a water-repellent and extremely durable material. Fastening with two way zip, storm flap and press studs. Chest pockets with flap and press studs. Elastic at the waist, front pockets with storm flap. Access to trousers from both sides. Inner pocket - one with zip and one with hook and loop band. Hook and loop band fastening at the foot. 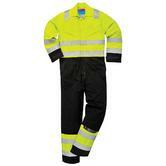 Mascot Thule Hi Vis Coverall material: 60% cotton/40% nylon, 240 g/m². 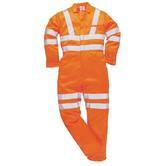 These coveralls give complete protection for anyone working near roads motorways or traffic. The heavyweight fabric and rugged design make sure the coveralls lasts longer. Security Chest pocket with zip. 280g with a stain resistant finish. DuPont's patented, inherently FR Nomex Comfort fabric makes the Pioner Nomex coverall an incredibly lightweight, flame retardant coverall that offers the highest level of FR and Antistatic protection. These Brigade Navy 220gm Nomex covies are INHERENTLY Flame retardant, ensuring that they permanently protect you from fire spread. They have 2" nordic style reflective tape on shoulders, arms and legs; Pioner excellent fit and quality; 2 breast pockets, 2 side pockets, 2 back pockets and a brass YKK zip. Concealed heavy duty plastic two-way front zip to collar with heavy duty plastic press studs to provide additional protection against electric arc incidents. Fabric: Nomex® Comfort 220gm/2 (93% nomex, 5% kevlar, 2% anti-static fibre). Two front chest pockets with flaps and heavy duty plastic press stud closure. Two front slash pockets with double layer fabric side access to under garments for increased thermal protection. Pioner ARR215GCOV Nomex FR Coveralls certified to EN 531 (FR) and En 1149 (Anti static) norms. Lightweight version of our Riggmaster coverall has all the same safety benefits, while providing more comfort in higher temperatures. Secure and comfortable fit with an elasticated back waist for an improved fit. Concealed heavy duty two way zip fastening system with a brass press stud for closure at the neck area. Manufactured from Dale sateen weave, FR treated 250g/m² 100% cotton providing superior comfort to the user. Pen pocket on left sleeve and one right back pocket with concealed heavy duty brass zip. Right rule and leg pocket, left open back pocket, heavy duty stud closure at sternum and neck. Pioner LFM1125RIGG Lightweight Riggmaster Red FR Coverall conforms to: BSEN531 A, B1, C1 Fabric conforms to EN531 (E1), EN11612 and EN 470-1 safety standards. Work in low light conditions it's important that your workwear is visible - for your own and other people safety. 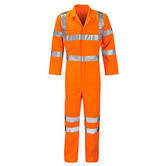 HI-Viz coveralls with reflective tape over the shoulders, arms and legs are standard issue where there are moving forklifts or trucks. The reflective tape bands are a key visual safety feature. These can be Waterproof, Flame retardant, Chemical resistant or made for Cold temperatures. The most important is - Visibility. More High Visibility options? Choose by EN standards: Minimum Hi-Vis Level, Medium Hi-Vis Level or Highest Hi-Vis Level.